I am quite glad that definition includes using a garland as a decoration, because I am not sure how this garland would look wrapped around my head. I made some fall garlands. I use a zig-zag stitch to attach the leaves and the paper circles to the twine. 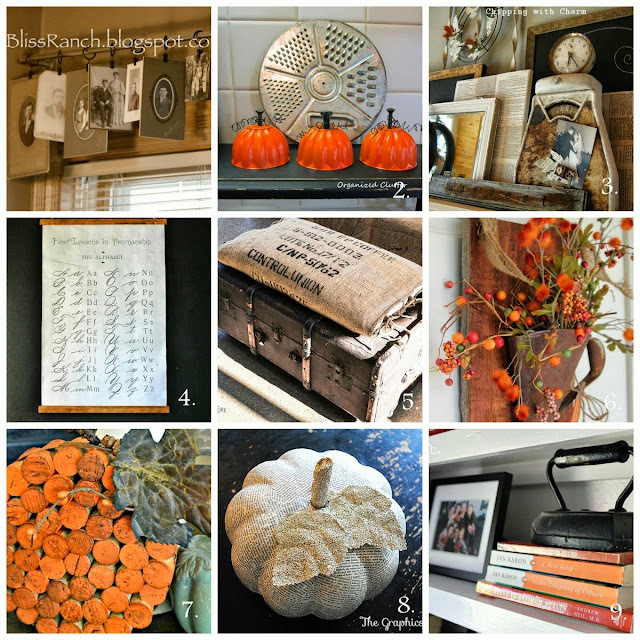 A simple and quick way to add a little fall color to your mantle (or in my case no mantle), a bookshelf, or across a window or mirror. Visit their blogs for hours of inspiration! Happy Fall--it is really here. 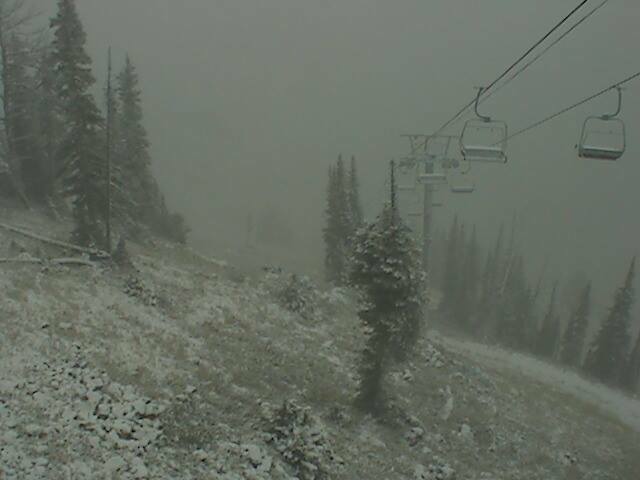 In typical Montana fashion, we are under a winter storm warning this first week of fall. That is not stopping me from thinking pumpkins, and leaves turning, apples, and hayrides--oh my! 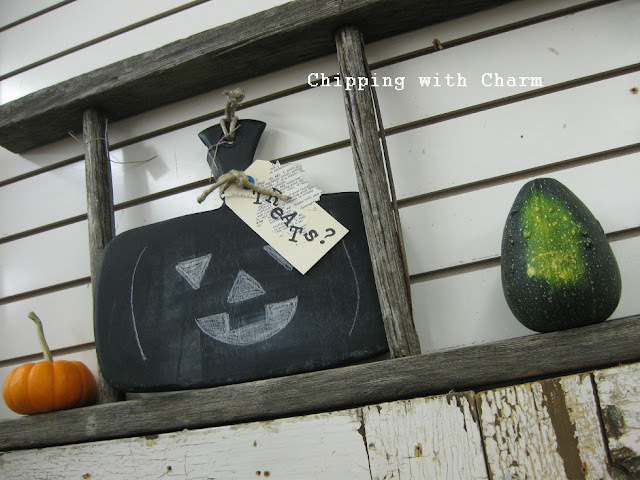 When I spied Chipping With Charm's little chalkboard pumpkin created with a cutting board, I knew I had to make some too. I decided to make mine orange so I added a couple Tbsp. of unsanded grout to a bottle of acrylic craft paint to make chalkboard paint. I picked up the cutting boards at the thrift store for a dollar or two. A couple coats of paint and a green painted stem and I have some fun pumpkin chalkboards--perfect for kids or adults. I love the shape of this guy! A piece of burlap tied in a knot makes a great eraser. 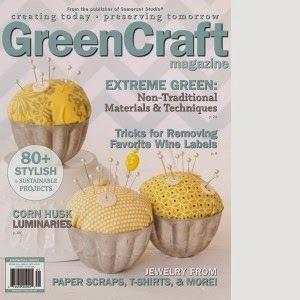 Easy, and a fun, little fall gift for someone special. My OLDER sister is one of my biggest supporters. I think she genuinely loves most of what I make so when she called a couple days ago and requested a fall sign for her front porch how could I say no? She has decided she needs a sign for each season, so I sign she will have :). I do love her dearly, even if she is my bossy older sister ;-)! I used a ruler to pencil out the chevron, painted the pumpkin first and then the stripes. I stenciled the words and free handed a green shadow for the letters. I know the "shadow" is not scientifically correct, i.e. there is shadow where there shouldn't be any. Rocket scientist I am not, but quick sign painter I am. I think big sis will enjoy it! On another note, I purchased a fuzzy orange blanket for fall from TJ Maxx today--the dog approves. Are you ready for cozy flannel yet? and was wet and rainy here in the valley, with the temps in the 40's. Tomorrow it might be 80 again, but today was a flannel kind of a day. So I made myself a cup of tea and sewed a bit. I used some flannel shirts I had been picking up on half price days from the thrift stores. (This is Montana--we have a plethora of flannel shirts!) I had been collecting them to make a scarf. A tip: when using thrift store clothes for fabric, always look in the big and tall and plus size sections--more fabric for your money. I cut the arms or body of the shirt into rectangles and sewed them into two identical long strips. I then sewed these, right sides together of course, into a tube, turned it, ironed it, and stitched the end closed. Simple and cozy! I am not sticking my tongue out at you, but to my daughter, who was laughing at the faces I was making while modeling the scarf. I used a few of the extra pieces from the shirts to make a couple pillows. I buttoned 2 different shirts together and also have a third shirt pattern for the back of each pillow. but I still like them--warm and homey! I am afraid there are not too many brain cells firing right now. I am getting ready for a show. And while I am excited, I also bust it trying to get done EVERYTHING I planned and dreamed I would create. It never happens, but I do try. I decided I didn't have enough big pieces so I hobbled this bar/serving table together 2 days ago. I started with an enamel top from a disabled hoosier base. I painted it with chalk paint because it was badly scratched. My neighbor said, " I could never imagine this or think up something like this to make." I told him I had no idea what I was making when I started, that I can't think it up or all the way through before I start--I just put pieces together until I end up with something. I used a drawer for a base and some nice 4x4 legs (from the aforementioned neighbor). I decided since this ended a little taller than I planned, there was room for shelf, so I threw that in there. and a level for a towel bar. Sorry about the background--I was the only one home and this piece was too heavy to move very far for photos. I am pretty sure the new neighbors moving in across the street think the lady bringing wine and cheese and crackers to the photograph in the front yard is crazy. I bought this dresser several years ago. She has been hanging out in my basement. storing "stuff", waiting for a new life. Today was the day she was reborn. I think I avoided this piece in the past because the glossy, flaking paint scared me. 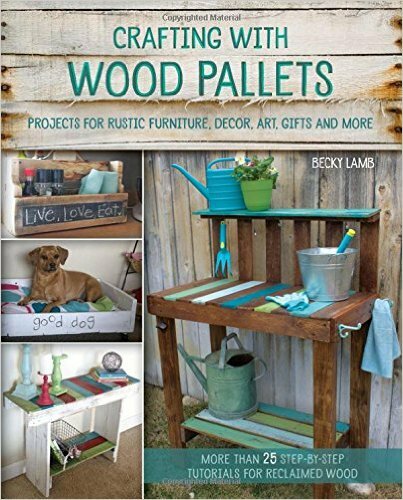 But with chalk paint, that is no longer a problem. I did have to use some wood filler on the top back edge and sanded a bit to get the flaking paint off. 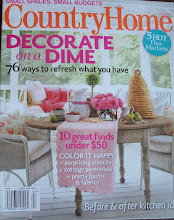 I used French Linen from Annie Sloan to paint 'er up. I put the paint in the fridge for about 30 minutes ahead of time to thicken it up and then painted one coat, painting in a messy manner. I sanded with a fine sand paper. and the chippy paint that came through. I used spray adhesive to line the drawers with 1912 Saturday Evening Post pages. 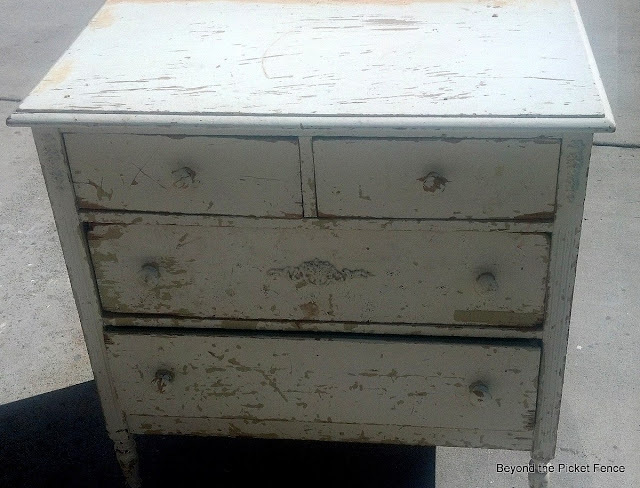 Chippy, shabby and sweet--ready for a new home.